Come see this beautiful .40 acre corner lot home with fenced-in back yard. 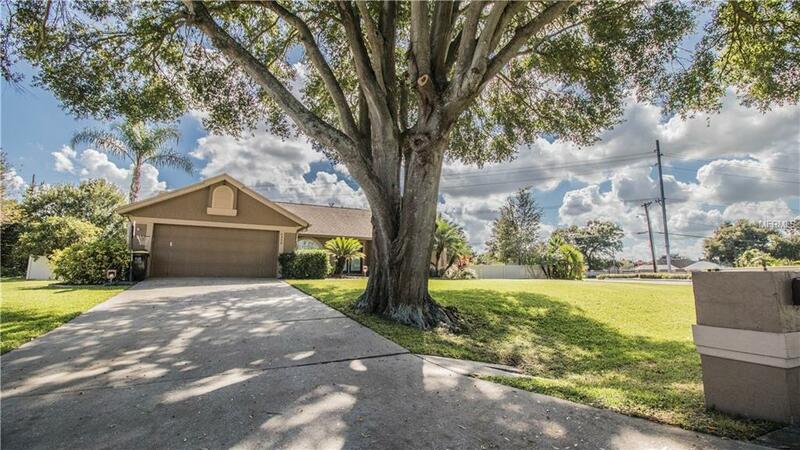 Home is located in a desirable south east Lakeland. Many updates completed to this 3 bedroom/2 bath with living/dining room, separate family room with wood burning fireplace. The 14x20 pool was resurfaced this year and includes a new pool pump. New A/C, fresh interior paint, new custom plantation shutter in living room, new light fixtures in living room, master bedroom and another bedroom. As you enter thru the double pane front doors, you will see the spacious living and dining room. The master bedroom has a spacious walk-in closet, sliding glass door over looking the spacious back yard pool and pond. the master bath features double sink, large shower and more. The beautiful kitchen features a pantry and breakfast bar, spacious nook, stainless steel appliances. The family room boasts a beautiful wood burning fireplace and sliding glass door access to a large screen lanai and pool, overlooking a spacious fenced back yard with running water fountain pond. Call and schedule your showing today.